Instead of writing an extra long entry into my newsletter and a section on the photos regarding this day as well, I decided to put it all here on this page. Weather: 75 degrees F, 85% humidity, sunny. Aim: Repot all my iris not including the two new free ones I got this year. I realized that my iris were last repotted on 9/10/04 and needed repotting. The yellow flag iris was so huge, I did not know how I would deal with it but I have before. 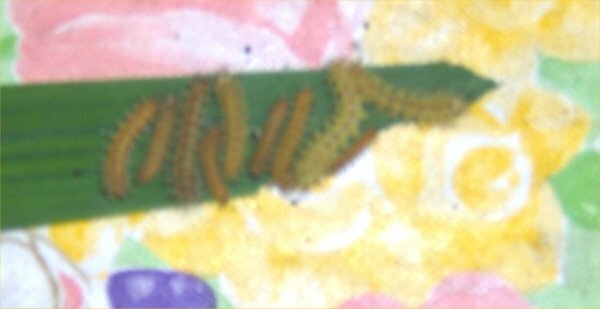 On 8/27/06, I was stung by a nest of buck moth caterpillars hiding in the yellow flag iris. Here is a photo. I talk about this in my September 2006 newsletter. The dates stamped on the digital photos are in the European method of dating of day/month/year and not month/day/year like we do it. I assure you, it was 9/4/06 (September) and not 4/9/06 (April). 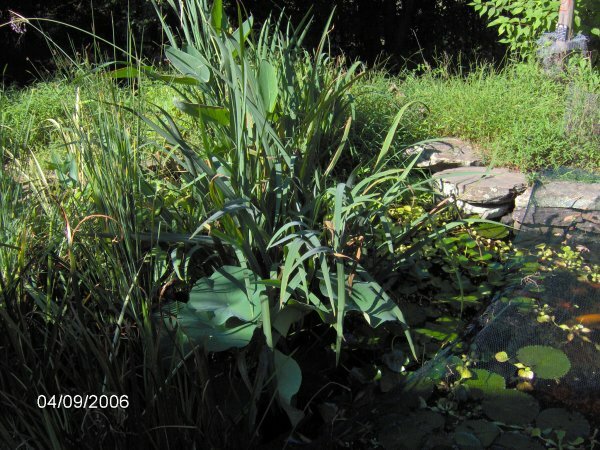 To start, this is a photo of the pond taken facing southwest showing the huge yellow flag iris before I began. 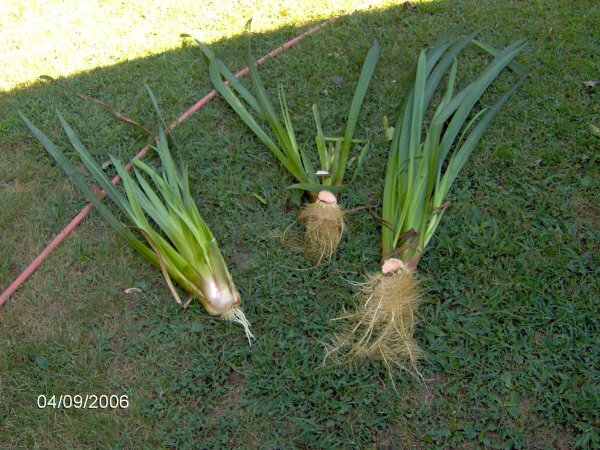 I went and hacked down the yellow flag iris that was growing loose in the pond overflow. 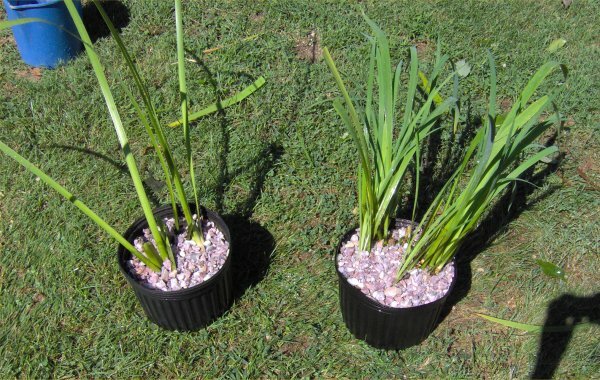 Back around 1999, I spread a bunch of iris seeds there which I have since come to regret. Only the yellow flag took hold. I always worry about it punching a hole in the liner. I also cut down some rice cut grass in the overflow and pulled out some weed grass. My entire area around my pond is just weed grass! Here you can see the overflow after I have cut the yellow flag iris down so just the base is left. I took a photo of the huge yellow flag iris from the other side of the pond, facing southeast. To get an idea of its size, those waterlily pads are pretty big (maybe half a foot across) as is the hardy canna on the right. 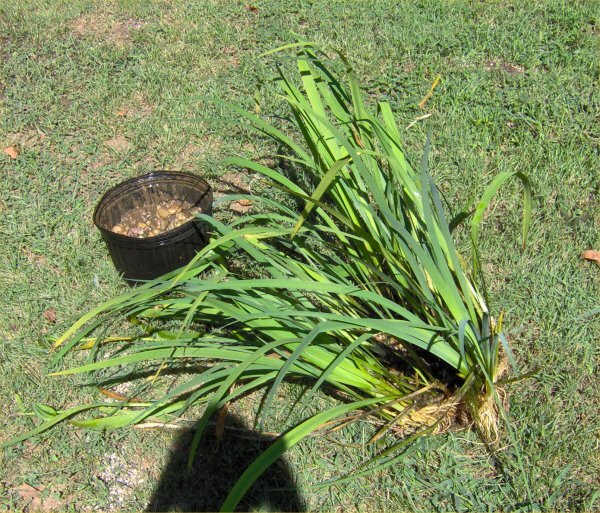 I got into the pond with a hack saw and cut the yellow flag iris apart. I managed to cut off three chunks that included roots from where it jumped the pot. The saw goes faster than pruners for such a huge plants. Here is a photo once I got out showing the hole where the iris used to be. On a rock at the back, you can see the iris pot with the remnants of the iris. This photos is the same view as the first one. You can also see where I had to flip the tropical waterlily leaves back onto themselves at the bottom which is where I walked in. 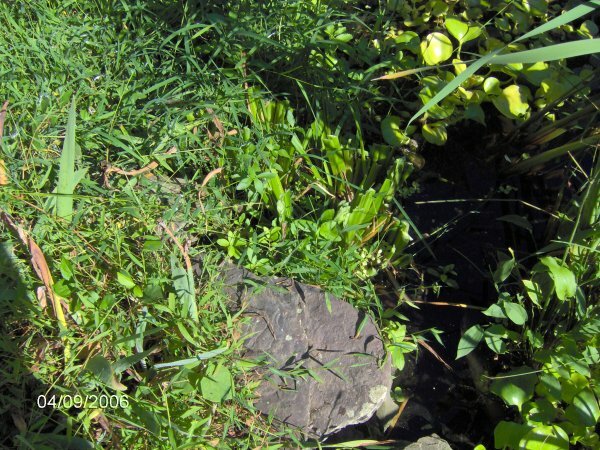 Here, you can see a close-up of the yellow flag iris and what is left of it. 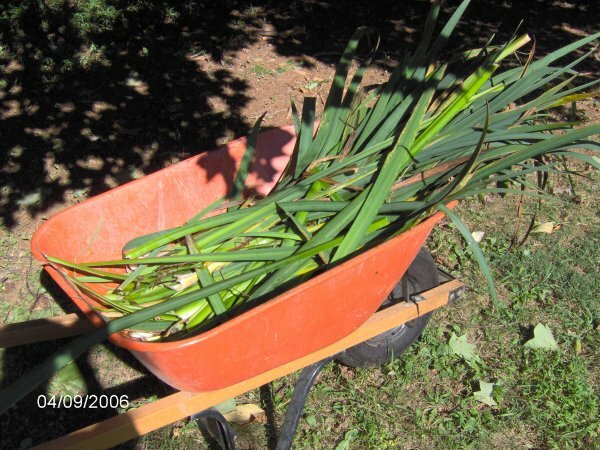 I gathered up the leaves I cut off and put them into the industrial-sized wheelbarrow. Here are the three pieces I saved. The one on the left had less roots. Since I only had room for two pieces, that one I buried on land out front in an area that floods after heavy rains. Some yellow flag iris is alive there from when I planted some years ago so it can survive on land. I rolled the pot and yellow flag iris down the hill. While doing that, it seemed like it might come out of the pot. Yes, I was able to save the pot! Here is a photo of the pot next to the root ball that somehow was actually in there! The pot is a 4 gallon pot I think. I squirted out the pot and drove it to the garden in the wheelbarrow where I filled it up with clay dirt. 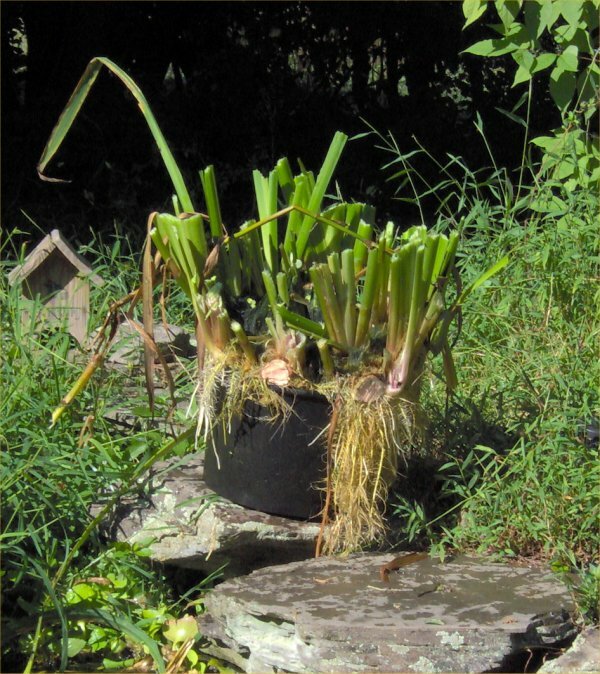 Back at the pond, I potted the two iris pieces back into it. I put four PondTabbs fertilizer pills down in the dirt. Here is a photo. I then rinsed off some rose gravel and spread that in the pot as shown here. I also cut off any leaves that were chewed on by bugs or had flopped over. I squirted it down with the hose. Here is a view from above. The yellow flag iris done, I needed to find the rest of the iris. I found the blue flag iris behind the yellow flag and pulled it out. 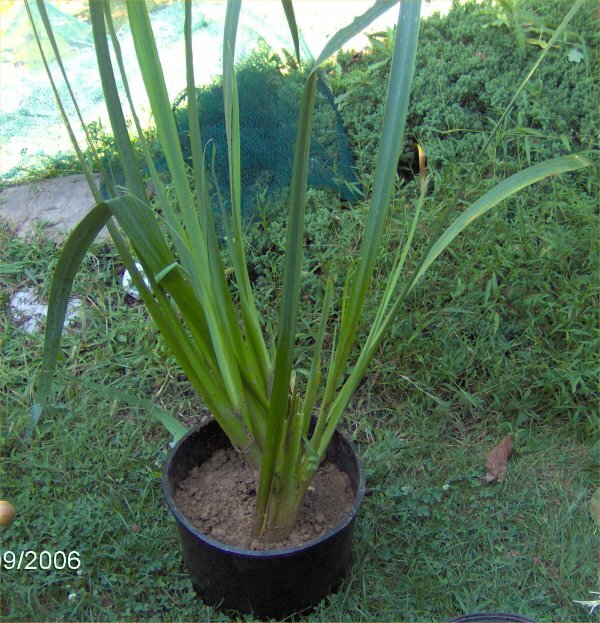 I pulled out a pot behind that that I thought might be iris but it was sweetflag. It brought with it another pot which was mostly empty except for the sweetflag that jumped into it. I think it had the new red hardy waterlily, completely gone. 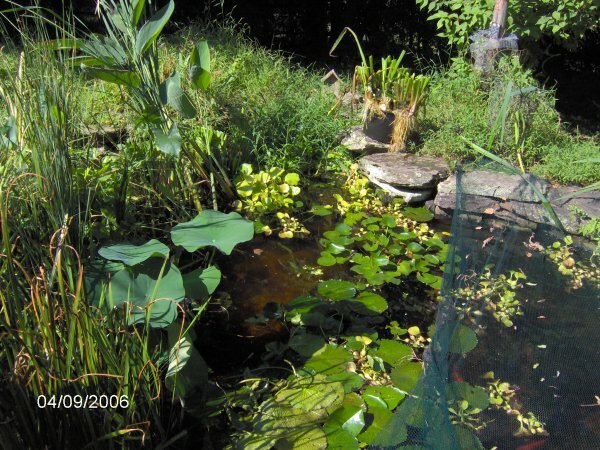 Getting out the pond, I went to the southeast corner where I have a few iris. I did not need to repot the two new iris I got free this year but there were two other ones. I pulled out one which was mostly adultered with sweetflag. 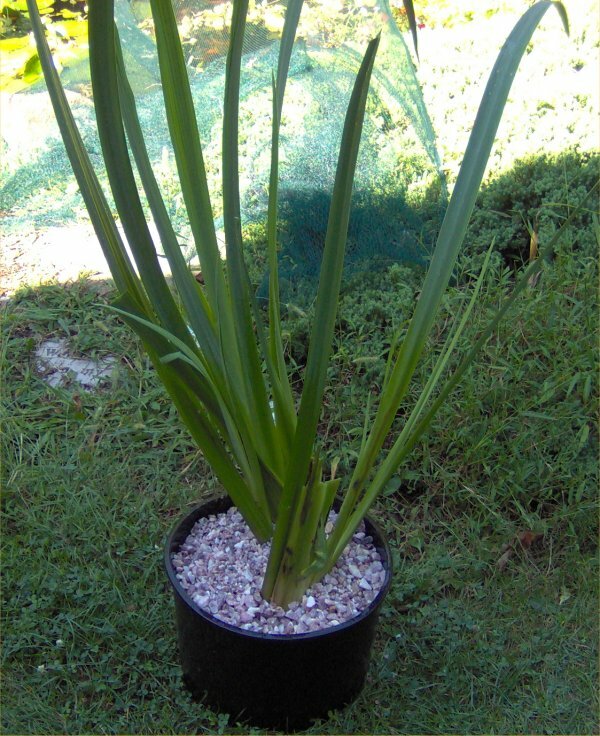 That was the white iris that I bought as a black gamecock (so much for black!). I did not find the other one (Colorific iris) until after I had finished with the other iris so I will save it for next week hopefully. 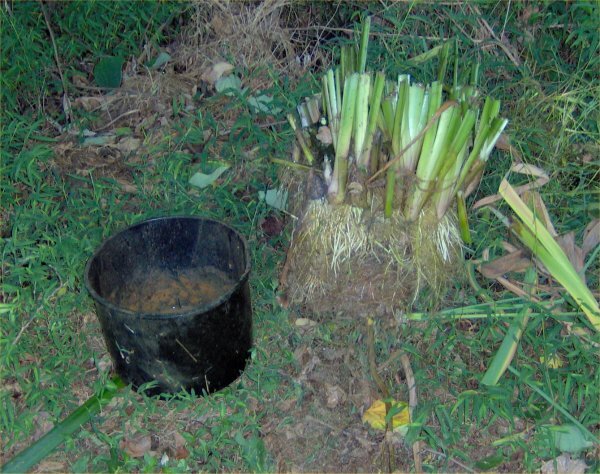 Here is a photo of the blue flag iris and the pot it was in. The whole root system came out the pot when I lifted it up. 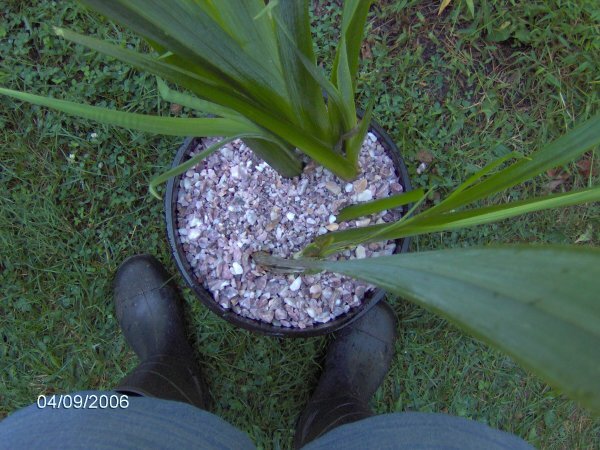 I move the heavy iris pots by grabbing the leaves like pulling someone's hair. Here you can see the white iris at the bottom still in the pot. Almost all of what you see is actually sweetflag that jumped into the pot. 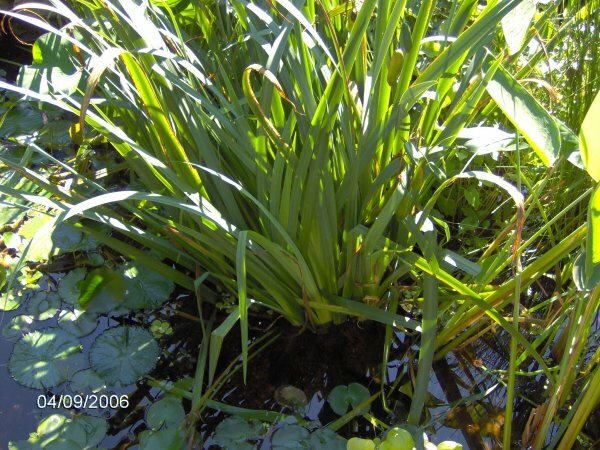 Sweetflag grows like a weed in my pond (like the yellow flag iris). The blue flag iris is behind that. So, how on earth do I tell sweetflag from iris you ask? Here is a photo of both of their leaves next to each other. The sweetflag is on the left. You will notice a few differences. 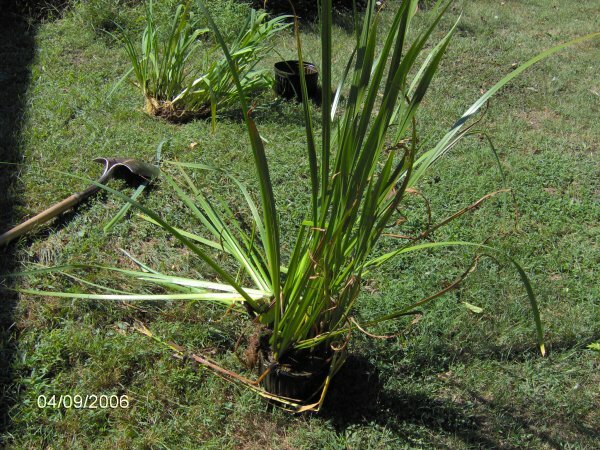 The biggest one is that sweetflag has a hard ridge that runs up the middle of the leaves. When trying to tell which is which, I feel along the leaves for that hard ridge. 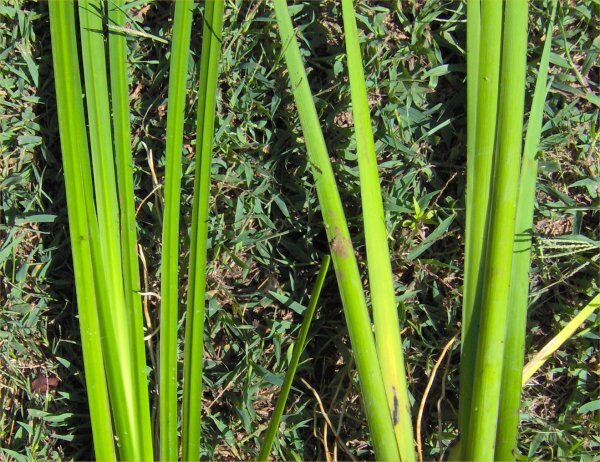 Also, the sweetflag leaves are less plump than the iris. If you squeeze them, the iris are more squishy. Here are the tubers that I repotted for the blue flag and white iris. 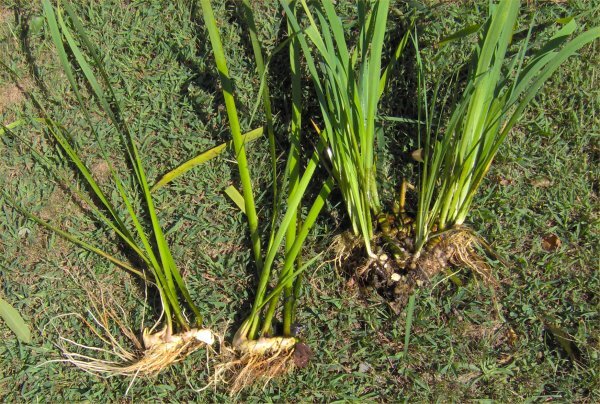 The two on the left are the white iris while the one on the right is about half of the blue flag iris. The other half I dug into the ground as with that extra yellow flag iris. Finally, here are the finished iris ready to go back in. The white iris is on the left and the blue flag iris on the right.